For those of you not following along on Brigitta’s FaceBook page (because really, what else do you have to do? ), I’ve included a few highlights below. I participated in 26 events over the course of 27 days. The book tour was really about the release of the accidental novel (Brigitta of the White Forest) but I included a few poetry gigs along the way. Couldn’t help myself. Poetry, she just keeps sneaking back into my life. 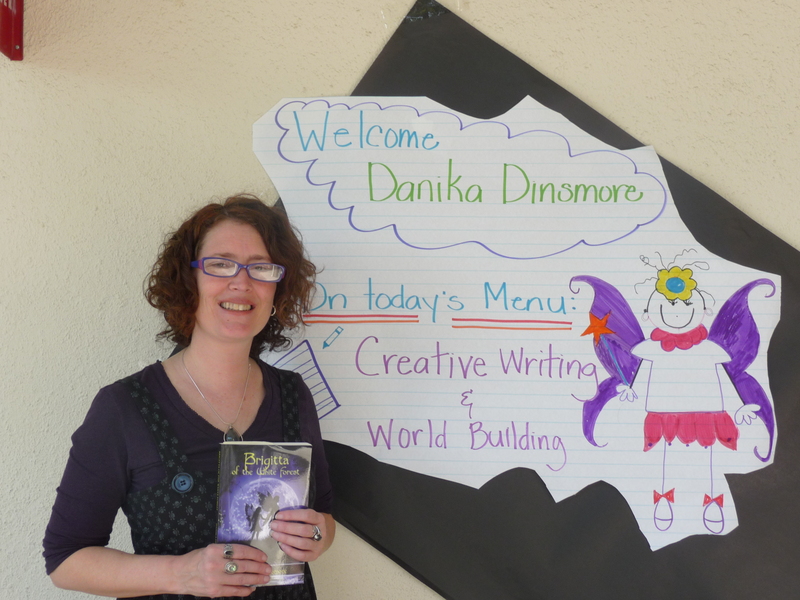 On my tour I visited seven elementary schools (putting on 5 assemblies, 2 workshops, and 2 classroom visits). 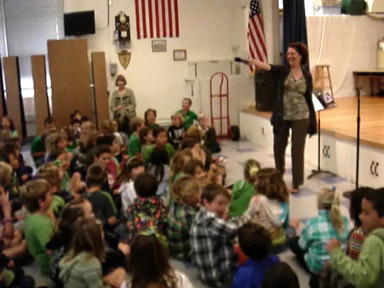 My first assembly was at Pierpont Elementary in Ventura, CA. 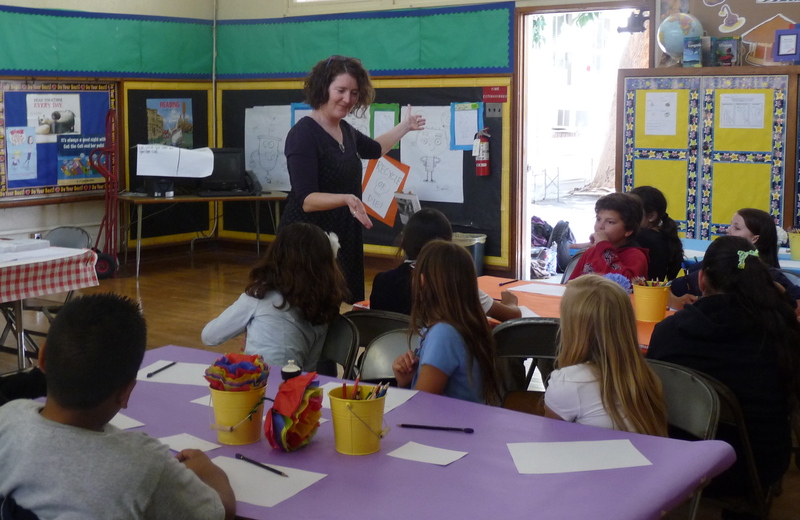 Here I am at San Rafael Elementary school in Pasadena working with a select group of inspired students. 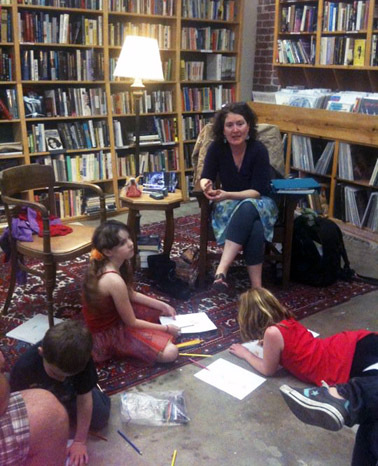 Alyson Beecher, the principal, took the photos and blogged about the workshop. 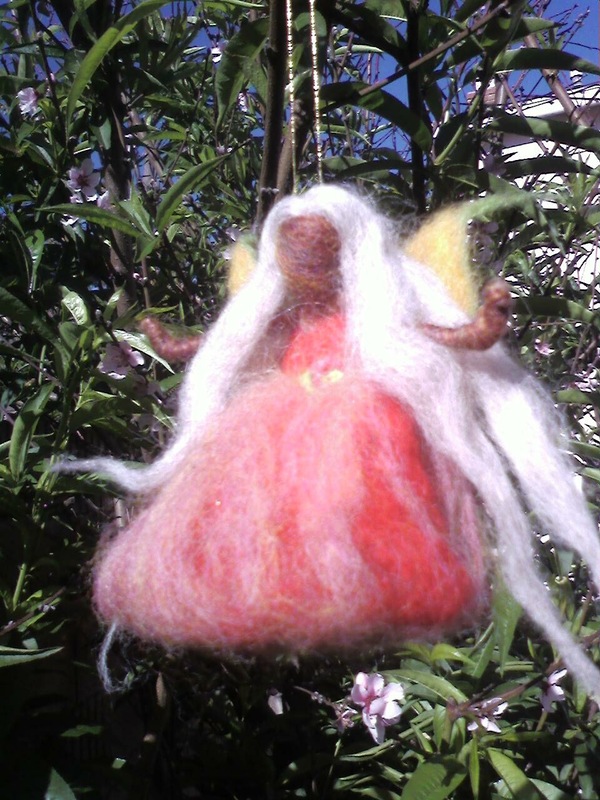 Another wonderful workshop (for adults and kids) was the Faerie Felting workshop that I co-facilitated with Borbala Arvai – a brilliant felting artist. (see her BoriDolls site). I read from Brigitta and introduced the class to the different kinds of elemental faeries and then Borbala wove (er, felted) her magic and taught us all how to make our own felted faeries. Ta Da! My very first felted faerie. Thanks, Borbala! It’s difficult to say which was my favourite event, they were all so unique. 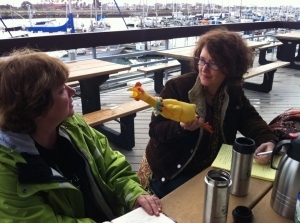 But I have to say that poet, Art Predator, and wine-blogger Gwendolyn Alley and I had a great time creating a workshop that started out on the beach and ended with wine-tasting activities at the gorgeous Old Creek Ranch Winery. What’s not to like! It was also Take Your Chicken to Work Week, so we complied by bringing one along wherever we went. There were so many other fabulous stops on the tour I can’t possibly include them all. There were book store readings, workshops at the Ojai Word Fest, the book fair at OWF, book launch parties, a poetry slam (I took 2nd place – Gwendolyn Alley came in 1st), and numerous visits with family and friends. I even snuck in a trip to Disneyland. Thank you to everyone who loaned me a couch or bed to surf on or bought me a fish taco or margarita! Yay Book Tour! Yay Book Trailer! I am loopy from lack of sleep. Giddy for the excitement. And nervous about doing 26 events in 28 days!!! Yup. I have been working on this book tour for 6 months and recently it’s been pretty much a full time job. I knew it was going to be a lot of work, but it was honestly harder than I ever thought it would be. The novel may have been accidental, but this side of it has been serious planning all the way. I kick off my Imaginary Worlds Tour this Monday with a reading and book signing at University Books in Seattle, WA. 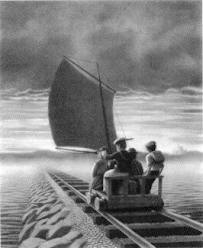 For more Imaginary Worlds events, visit my Brigitta of the White Forest events page on facebook. I will also do my best to blog about the experience along the way. Today I kick off my Imaginary Worlds Book Tour with a virtual stop at Just Deb, where you will find an interview AND a book giveaway for the First Fan Edition (which we are almost out of and you can only order from the publisher). The “mainstream” edition is available on Amazon, Barnes and Noble, and may be ordered from any bookstore in North America. Deb Marshall is an assistant manager of a small town library, storyteller and writer. She also runs their library’s Backroom Kids Book Club. She is a grand supporter of Canadian literature and is running an Oh (MG/YA) Canada! Reading Challenge. Readers are challenged to devour one Canadian author’s childrens’ book per month for the year. You can find her list of suggested reading HERE. I don’t have dates for my other virtual book tour stops. I’ll just have to announce them when they appear. But the physical (!) book tour starts next week and public events are listed on Brigitta’s FACEBOOK page. I have been negligent here as I gear up for my book tour, which starts in 10 days and includes 25 separate events. I’ve been a marketing machine (and my creative side has been sorely neglected). In the middle of all of this, we’ve (me and a team of talented film people) been working on creating a LIVE ACTION book trailer for Brigitta. We’ve got 11 HOURS left to raise $670 on Indie Gogo! Not sure if we’re going to make it (especially since a few people were having trouble getting their donations to work on the site), but we’re going to try, even if it’s $10 at a time! Yvette gets her Hrathgar on! (more photos on the UPDATE section on the campaign page). We’re cutting a “teaser” now and shooting the rest of the trailer in April (due to my long book tour in between), but we have to raise the money now to get the rest of the props built. 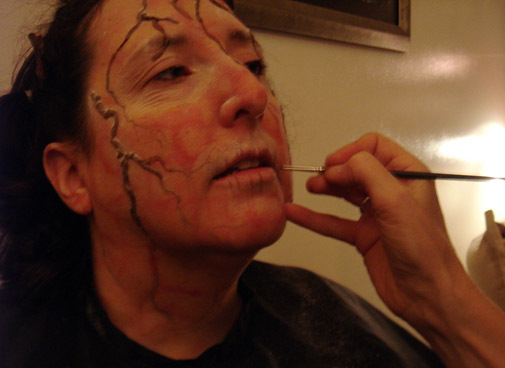 Everyone is donating their time and talent – the funds go towards prop building, make-up, equipment rentals (monitor, sound, etc), and food for happy crew members. Every bit helps and if you’re not in a position to donate, your happy good vibes juju and cheering help too! We like that.